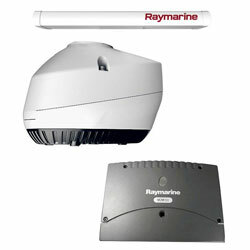 Raymarine Magnum 4kW Pedestal is compatible with either a four-foot or six-foot antenna array option. It offers a maximum range up to 72nm. The perfect companion to Raymarine's award-winning Axiom® and Axiom Pro multifunction navigation displays (MFD) running LightHouse 3. Magnum is also backward compatible with legacy models including: LightHouse 2-based a, c, e, eS and gS-Series MFDs, C-Series Widescreen and E-Series Widescreen MFDs, E-Series Classic, and G-Series Multifunction Displays. Note: Not all Magnum features are available on all legacy MFDs. Superior Bird Mode: Building upon their already exceptional bird identification technology, Raymarine has further advanced Magnum's Bird Mode feature to target birds with greater clarity up to 10 nautical miles. Locating flocks of birds with Magnum helps anglers find schooling baitfish faster and with less fuel consumption.